Nearly one hundred years after it happened, on November 7th by the modern calendar, the ‘October revolution’ in Russia in 1917 is still regarded by socialists as the greatest event in human history. Under the leadership of the Bolshevik Party, it brought into existence the first, and so far the only, workers-led government to hold power for any length of time. With its appeal to the workers of the world to follow suit, it set out to sweep feudalism and capitalism from the face of the earth. This was the most democratic form of government ever embarked on. The Bolsheviks drew on, and developed, the experience of the Paris Commune of 1871 and of the workers’ councils set up during the revolution in Russia in 1905. All major decision-making was to be done through a system of ‘soviets’ – of workers’, soldiers’ and peasants’ delegates – at a local, regional and national level. Any paid representatives were to stand regularly for re-election and receive no more than the average wage of a worker. By the Summer of 1918, Russia was out of the World War. Land had been taken over by the state for the use of the poor peasants. The country’s major banks, and industries had been under workers’ control and were now nationalised. A rudimentary workers’ management of industry and society was operating through the country’s elected soviets at local and national level. The idea of revolution had spread like wild-fire internationally. By the end of 1918 the workers’ uprising in Germany had forced the Kaiser out of power. The following year in Hungary, an attempt was made, under the leadership of Bela Kun, to emulate the Russian revolution. In Britain strikes had increased six-fold in 1918 with 35 million working days ‘lost’ in 1919. Dock-workers in London refused to load arms for use against the Bolshevik government. 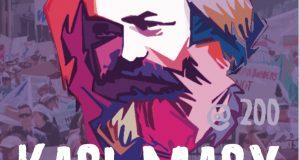 Most Marxists had expected the first successful socialist revolution to take place in a predominantly industrialised country with an experienced working class, such as Germany or even America, and later spread to less developed economies. But capitalism broke at its weakest link because of a very special coming together of factors. Russia at the time of the February revolution in 1917 was a vast, war-drained, country. Eighty percent of the population were impoverished peasants many working on the estates of aristocratic families and of the ‘new rich’ of the business world. Only a small percentage of Russia’s workforce was engaged in industry. Two million Russian soldiers, most of them from peasant families, had already been slaughtered in the blood-letting of the first world war. What industry there was in Russia was relatively modern and foreign-owned. Workers drawn from the countryside, were housed in hovels and concentrated together in large factories – mostly in the main cities of Moscow and Petrograd – the country’s capital at the time. The Tsars had operated a suffocating police state in order to try and maintain their vast empire and pampered existence. Before 1905 all opposition forces had been illegalised. Narodniks – Social Revolutionaries based themselves erroneously on the peasantry and on the tactic of assassination – of Tsars and government ministers – to ‘detonate’ revolution. Many were executed or at best exiled. Marxist Socialists based themselves on the industrial proletariat as the motor force of revolution. They, too, were persecuted and imprisoned. Their organisations were driven underground and their leaders into exile. Strikes were forbidden. Generations of revolutionaries in Russia had fought the tsarist regime and developed their ideas through studying books and their own experience of struggle. By the beginning of 1905, strikes and protests were mounting against the background of Russian forces being humiliated in the war with Japan. In Petrograd, on January 9, a peaceful protest of striking workers and their families from across the city, led by a priest made their way to petition the Tsar’ for decent conditions and political freedoms. Government troops opened fire and hundreds were killed and injured. Strikes spread across the country. A mutiny on the battleship Potemkin in Russia’s Black Sea Fleet sparked more mass protests in Odessa, in which many hundreds of people were killed. A general political strike developed in October during which workers’ ‘soviets’ or councils were thrown up – a new form of representative body. Delegates were elected from the workplaces and came together to discuss the key issues in the struggle and also to execute whatever plans were agreed. They were seen as a major threat to the old order, coordinating every strike and demonstration. The Tsar reacted to the uprising by promising an elected Duma – a suggestion dismissed by the soviets as an inadequate sop. The strikes and mass demonstrations continued. Eventually, not having found sufficient support in the countryside and in the army, this revolution was defeated. On December 3, the Petrograd soviet was broken up and its leaders arrested, including Trotsky its president. Ferocious battles continued in the workers’ districts of Moscow with many hundreds killed. In the course of 1905, thousands of lives were lost and many opposition fighters executed. This ‘dress rehearsal’ for the events of 1917 wrung certain democratic rights from the regime – such as elections to the Duma, the legalisation of the press and trade unions. But many of the movement’s political leaders were either in prison, in internal exile or abroad. The workers and peasants bowed their heads to the yoke once more, harbouring enormous resentment against their oppressors but taking time to recover their fighting capacity. In spite of certain democratic rights having been won, a period of reaction set in and ideas alien to the workers’ movement came to the surface. But the workers’ movement revived. By 1912, important strikes were breaking out in factories and mines across the country. On 17 April, a mass demonstration of striking workers at the Lena goldfields in Siberia was brutally attacked by armed soldiers. Hundreds were killed and wounded. This massacre “inflamed the masses with revolutionary fire” commented Lenin, the eventual leader of the workers’ government established five years later. The massacre of oil-workers by government troops in Western Kazakhstan in 2011 could have had the same effect, or the shooting down of platinum miners in Marikana, South Africa two years ago. Similarly, the angry response of workers and their families to the mining disaster at Soma, Turkey – the direct result of cutbacks in safety by cronies of the then president, Erdogan, who bought up the mine cheap when it was privatised. Such events are etched in the memory of the working class, not yet ready to launch an all-out offensive against their governments but feeding their determination to ‘get even’! 1912 in Russia was also the year that the RSDLP finally split into two separate parties – the Bolsheviks and the Mensheviks. The Bolsheviks, under the leadership of Lenin, were intent on building a revolutionary party with trained cadres and serious, committed members in the factories, the army and the navy. The Mensheviks favoured a looser form of organisation. Both, at this time, shared the view that the first stage would be a democratic revolution against feudalism in the shape of Tsarism and the ‘landed gentry’. Then, in theory, after a period of development of capitalism, a move could be made towards socialism. Although Trotsky was neither a Menshevik nor a Bolshevik until five years later, he was closer to Lenin’s party. He began, as early as 1904, to outline his theory of ‘permanent revolution’ in ‘Results and Prospects’ which was published in 1906. Before Lenin came to the same conclusion, he was arguing that, in ‘backward’ Russia, the revolution to overthrow the monarchy and feudalism would need to be combined with the socialist revolution, under the leadership of the working class. In the interests of maximum unity in struggle, Trotsky had been advocating the re-unification of the RSDLP (for too long, by his own admission). He had formally remained with an organisation called the Mezhrayontsi (Inter-District group), but when he joined the Bolsheviks in July of 1917 he was readily accepted as one of the party’s ablest leaders. The February revolution of 1917 came after months of strikes and unrest. On International Women’s Day (March 8th but February 27th, according to the pre-revolutionary calendar) women textile-workers in Petrograd began to walk out of their factories. They demanded an end to food shortages and price rises, and also an end to the war. They were enthusiastically joined by tens of thousands of other workers. The Tsar had dithered and shown his inability to introduce reform. He ordered the troops to fire on the demonstrators. Hundreds were killed and injured. The workers’ appealed to the soldiers to refuse any further orders to shoot. Eventually they were convinced and the rule of the Tsars was over. The atmosphere was one of joyous celebration. Workers had moved onto the scene of history, come onto the streets in a veritable ‘festival of the oppressed’. They had removed a hated government and held power in their hands, but did not know what to do with it. In this situation a revolutionary party is needed that is trusted and well known amongst the workers, which has a mass base and a leadership which can indicate the steps that need to be taken to stop reaction regaining the upper hand. The Bolsheviks, who had a leadership with a clear perspective for the development of the revolution, were still a relatively small force. As so often in revolutions, the workers who had made it took the apparently easier way out – handing power to the available, apparently ‘progressive’ politicians. The government that came into office was indeed ‘provisional’ and was from the very beginning rivalled by the Petrograd Soviet of workers’ and soldiers’ representatives in a situation characterised as ‘dual power’. This body commanded more support amongst the population of the city than the government. At this stage, the Menshevik party had the support of a majority of the workers’ and soldiers’ representatives but were doomed to lose it as the tumultuous year progressed. The Provisional Government was a government of crisis from the very beginning. It agreed to elections for a constituent assembly, but, by the time such a body could be convoked…after the victorious October revolution…it would no longer reflect the real relationship of forces in society. Lenin returned to Petrograd from exile on 3rd April 1917, urging the Bolsheviks to see that the first revolution had to ‘grow over’ immediately into the next one – the socialist one. His ‘April theses’, declaimed from an armoured car at the Finland station and elsewhere in the city, were published in the Bolshevik newspaper Pravda on 7 April. He expressed total opposition to support being given to the provisional government by the Bolsheviks inside the country under the leadership of Lev Kamenev and Josef Stalin, who were putting forward the same arguments as the Mensheviks. The Mensheviks were supporting the government from outside. In May, they decided to enter into a government coalition with the ‘liberal’ Constitutional Democrats. The Bolsheviks then launched the demand of ‘Down with the ten capitalist ministers!’ to expose the SRs’ and Mensheviks’ failure to push for a government that truly represented the forces that had made the revolution. Little had changed in society. The war continued to drain all available human and industrial resources. The provisional government had neither removed the capitalists from power in industry nor the feudal landlords from power in the country-side. In many cases they were one and the same. The revolt in the countryside spread like wild fire. Estates were seized and stately homes burned down. In the cities, demonstrations against the war multiplied. The Bolsheviks’ simple slogan of ‘Peace, Bread and Land’ accorded with the deepest desires of the mass of the population. It led workers, soldiers and eventually the peasantry to see for themselves the need to carry the revolution further. Tirelessly the Bolshevik Marxist workers’ party continued its agitation in the factories and at the front. By the middle of 1917, the Bolsheviks had increased their support in the city’s central soviet of workers’ and soldiers’ deputies. Although many workers were supporting the call ‘All power to the soviets’, the Bolshevik leadership around Lenin advised against a direct challenge for power until all the conditions for a successful revolution had matured. They felt the armed forces were still not ready to risk siding totally with the socialist insurrection and nor were the provinces. 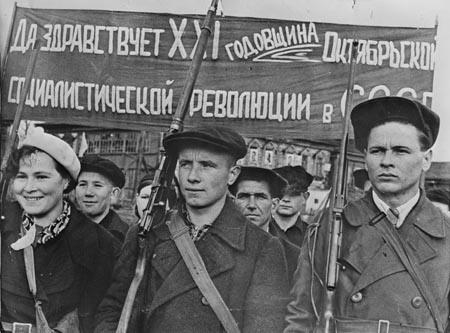 When a proposal came from below in July for a general strike and mass demonstration against the war and to bring down the government, the Bolshevik leaders felt it was premature and advised against it. But in the City Soviet they could not hold back the tide, and a majority agreed to go ahead. The movement held out for days against the police and the military, but, as Lenin and Trotsky had feared, it failed to draw them over to their side or at least neutralise them – another essential prerequisite for a successful seizure of power. At this stage the military obeyed the orders of the Kerensky-led government and the July uprising was put down in blood. On July 4th, hundreds of protesters were killed and injured. Bolshevik leaders were arrested or forced to flee the country. Vladimir Ilyich Lenin went into hiding. During his period ‘out of the public eye’ (out of the reach of the police) in August and September, Lenin applied himself to writing the vitally important pamphlet – ‘State and Revolution’. He outlined the basic principles laid down by the heroic French Communards of 1871 and those adopted by the workers’ and soldiers’ Soviets in Russia:- Regular election of all officials with the right of recall at any time; no representative to receive more than the average wage of a worker; the rotation of responsibilities ( -“Every cook should be eligible to take a turn at being prime minister, and every prime minister should spend some time being a cook!”); no standing (permanent) army but an armed people. He urged his supporters to spread the basic idea that a party aiming for the socialist transformation of society must understand the need to destroy the old state machine – courts, prisons, parliaments, armies – set up to enable the dominant but minority class in society (the 1%) to maintain its ownership of the means of production, distribution and exchange. What had happened in Russia already that year – the failure of the Provisional Government, now under the hapless Kerensky, to solve any one of the problems of the majority in society – had demonstrated conclusively the impossibility of simply filling up the old state machine with a socialist content. By the end of August, Kerensky was under threat from a different direction – an attempted far-right coup by General Kornilov. The Army’s Commander in Chief had decided the government was failing to deal harshly enough with the Bolsheviks and the soviets. It was the mobilisation of workers and soldiers led by the Bolsheviks who then routed Kornilov’s forces. Their mass ‘sabotage’ of the railways, as well as prepared ness to defend the government with arms ‘provided the gun-rest‘ for Kerensky to defeat reaction. But it enormously enhanced the power of the revolutionary forces in the soviets and gave the Bolsheviks an overwhelming majority in the soviets of the main cities by the end of September. The way for a revolutionary overthrow was rapidly being paved. The four conditions for a successful revolution spelled out by Lenin were all maturing rapidly. The first is a crisis at the top of society. It manifests itself in a split in the ruling layer, uncertain as to how to proceed – whether to make concessions or employ repression to deal with the developing demands for change welling up from below. It can reveal itself in one individual ruler – a vacillating monarch such as Tsar Nicolas ll or a government of crisis like that of Kerensky. The second objective factor in a developing revolutionary situation is a middle class in ferment, not sure which way to turn but beginning to throw in its lot with the organised workers. The middle layers in society – small farmers, shop-keepers and intelligentsia – are highly volatile and can move in one direction and then another, depending on who of their possible allies appears to be more on the ascendant and more likely to ease their troubles. In Russia in the Autumn of 1917 the mass of the peasantry was ready for a fight to the finish against the landed aristocracy. Their traditional defenders in the Provisional Government – the Social-Revolutionaries and others – were passive. The forces of the state – the soldiers, the sailors, the militiamen – had also lost faith in the parties of the Kerensky regime and were ready to take a neutral position and, in many cases, an active part in the revolution. The working class of Petrograd, Moscow and elsewhere was already on the move and involved in strikes and political action in opposition to the political representatives of the ruling class. They were prepared to take the fight to a conclusion. This third condition for revolution had also reached full term. The decisive fourth element necessary for a social and political revolution against capitalism to succeed is the existence of a party that has the confidence of a large part of the working class, with a leadership that can see the main line of march of events and can weigh up exactly what to do at each crucial moment in the struggle. Having had no more than 3% support in the soviets at the beginning of 1917 and just a few thousand actual members, by October the Bolshevik Party had hundreds of thousands of worker-members and a clear majority in the main soviets. They had support in the army and the navy and set up the Petrograd Military Revolutionary Committee that would lead the October insurrection. The leaders of the Bolshevik Party – both Lenin and Trotsky – had a clear idea of what was needed, but also a keen sense of timing. They were agreed on the necessity of ‘completing’ the revolution by removing the capitalist parties from government and the class they represented from power in society. It had taken the dialectical processes of agitation around slogans and revolutionary propaganda amongst a broad swathe of workers, soldiers and poor peasants, to help them draw conclusions, through their own bitter experience, that an all-out socialist revolution was necessary. Then the vital role of the leadership is to decide on the moment for decisive action once all the conditions have come together in the most propitious combination. Too early an attempt at insurrection would have led to an abortion; too late would have meant a still birth with reaction triumphant and a long period of recovery necessary before a new opportunity might arise. If the insurrection had not gone ahead as it did in Petrograd on the 25th October 1917 (7th November, new calendar), but had been delayed even for another day or two to allow for the All-Russian Congress of Soviets to take place, the relationship of forces could have changed dramatically for the worse and the opportunity lost for a generation or a century! The forces of reaction in the country along with those of the German invader, were threatening to close the opportunity for the Bolsheviks to bring down the Kerensky government; they had to seize the moment for insurrection. The uprising began on October 24. The Military Revolutionary Committee sent armed groups to seize the main telegraph and post offices and the State Bank, block the main road and rail entrances to the city and lower all the bridges except one across the River Neva. By morning Kerensky had fled and the Red Guards had taken over the Winter Palace. The seizure of power was swift and effective. Even the tougher ‘battle for Moscow’ was over in a week. By the morning of the 25 October (7 November) an order was issued for the transfer of power to the Petrograd Soviet, written by Lenin. An Extraordinary Session of the Petrograd Soviet took place in the afternoon and, in the evening, the Second All-Russia Congress of Soviets opened in the Assembly Hall at the Smolny Institute, headquarters of the revolutionary forces. An international appeal to workers, soldiers and peasants is made. The first decrees of the new soviet government, within hours of victory over the capitalist government of Kerensky, laid the basis for achieving the three basic demands of the revolution – ‘Peace, Bread and Land’. The decree on Peace meant the pursuit of a cease-fire and peace terms without annexations. The Decree on Land meant the immediate expulsion of the feudal lords from their estates and the allocation of land to be used by the poor peasantry. The Bolsheviks aimed to gear up the production in the cities of modern agricultural machinery, that would transform productivity on the farms. The small farmers would be encouraged to see the advantages for themselves, and for the city-dwellers, of the cooperative production of food. Soviet power was also to mean workers’ delegates taking over immediate control of banks and industry in preparation for taking them into public ownership in 1918 and setting out to manage them as part of a totally democratically planned state-owned economy. Attempts to snuff out the workers’ revolution failed. Twenty one armies were sent in by imperialist countries to back up the arch reactionary White forces in the Civil War. They were repulsed at great human cost by the heroic forces of the Red Army under the command of Leon Trotsky. 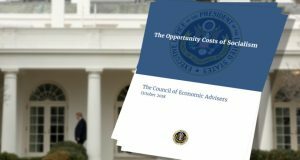 There was also enormous economic cost. Industrial production fell to one seventh of the value of 1913 and that of agriculture nearly halved. Hundreds of thousands of people had been killed and millions died from starvation and disease. The leaders of the revolution had long recognised that it would be considerably easier to take power than to hold onto it in their circumstances. They were acutely aware of the vital importance of spreading the revolution to other more industrialised countries, with a stronger working class, in order to develop rapidly the technique and practices necessary to ‘revolutionise’ industry, the railways, power production and mining, as well as agriculture, to establish a healthy planned economy. Even as the country struggled with the conditions of civil war, the Bolsheviks were under renewed pressure to establish a new international organisation to replace the discredited Second International whose main parties had supported the imperialist war. 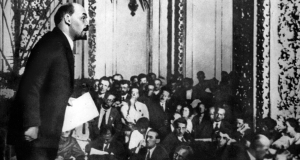 In the spring of 1919, representatives flooded to Petrograd from socialist and communist organisations across the globe to the founding conference of the Third (Communist) International. Such was the enthusiasm to join it, that before its second congress, Lenin established a list of 21 conditions for membership in order to prevent clearly non-communist forces jumping on the band-wagon. The victory of the revolution also inevitably meant the break-up of the Russian Empire – a ‘prison house of nations’. Lenin was sensitive to the desire of oppressed nations to exercise their right to self-determination. He nevertheless urged them to be part of a voluntary confederation. By December 30th 1922, when the Union of Soviet Socialist Republics was established, only Finland and Poland went their separate ways. The rest, including the first to declare independence, Ukraine, came together to pursue in tandem the new challenge of organising society on the basis of truly socialist principles. Huge progress was made on social as well as economic fronts. In spite of the enormous enthusiasm amongst workers and oppressed across the world for the workers-led government in Russia, it was left tragically isolated. Socialist revolutions in Hungary, Germany and elsewhere ended in defeat and after the death of Lenin in 1924, Josef Stalin switched the government’s policy to one of seeking ‘Socialism in One Country’. As he usurped the revolution, abolished workers’ democracy and exterminated all opposition to his rule, the Communist International became an instrument in his hands, not for spreading revolution elsewhere but for preventing it. The development of a healthy workers’ state elsewhere would challenge his dictatorship. His counter-revolution did not take the form of the re-establishment of capitalism. (This came much later towards the end of the 20th century after a period of slowing growth and the threat of stagnation). It was a political counter-revolution in the interests of a parasitic caste who had little connection with the revolutionary events of 1917. It sucked its privileges from the state-owned bureaucratically planned economy. Huge advances were made in spite of this development. Industry grew rapidly because of the elimination of capitalism and feudalism and the 5 year plans. But all elements of workers’ democracy were crushed and its advocates physically annihilated, including Leon Trotsky in exile in Mexico. The Third International acted as the policeman of workers’ movements around the world and a defence of the privileged position of the bureaucracy, only mouthing allegiance to socialism, communism and international solidarity while trampling on the heritage of the great Marxist teachers and leaders. A clear understanding of the processes of revolution and counter-revolution is vital for winning the new battles ahead. The conditions for a successful revolution cannot be reproduced according to a set model. Revolution is not like a scientific experiment – which uses an established set of equipment and known substances and procedures that guarantee a certain outcome. The objective conditions for revolution stem from the interaction of living forces – the constant collision of class interests between the minority – “the 1%” – property-owning class and the rest of society – “the 99%” – the predominantly propertyless and the super-exploited with all their intermediary layers. Revolutionaries study different revolutionary experiences as generals do different battles – to learn from mistakes in order to try and avoid repeating them. But no two battles take place against exactly the same background and with exactly the same forces engaged. Heroic mass movements have developed many times into challenges for power on the part of workers and youth, taking things into their hands and removing apparently all-powerful dictators. Those that come to mind most readily are the revolutions of North Africa. Tunisia and Egypt in 2011 saw events typical of revolution – when things move so fast that every day seems like ten years previously. The masses on the streets, the organised workers playing a decisive role with their strikes in overthrowing Ben Ali and Mubarak – there were elements of February 1917. But lacking in the situation was widespread socialist ideology and a Bolshevik or revolutionary party with broad support, making conscious the unconscious strivings of those who were making the revolution – a party whose leaders could see the need to take the revolution directly on to the task of finishing with capitalism. Without this, there has been no ‘October’ in these countries and not even any real democracy. Workers and young people who want to find a way of changing the ugly capitalist world we live in would do well to look at the lessons of the Russian Revolution. The most important conclusion to draw is to get involved in a party dedicated to the cause of workers and poor people and the building of a new mass force for socialism.